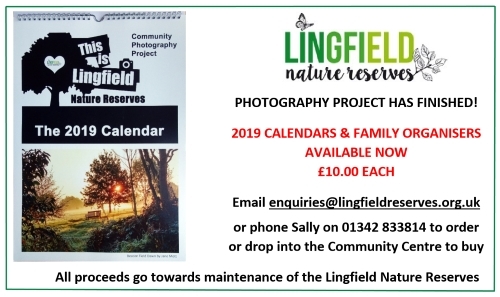 Welcome to the web-site of the Lingfield Nature Reserves. We hope that you enjoy browsing our web-site and, even more, that you enjoy looking around our nature reserves, which are only the 2nd village-based reserve in the country to be awarded LNR (Local Nature Reserve) status by English Nature. The reserves occupy a 26-acre site and are a mixture of meadows, hedges, and woodland copses and also boast a wetland area with a number of ponds and small pools, an orchard, a wildflower meadow and a butterfly garden. The reserves are managed in such a way as to gain maximum benefit for the flora and fauna, with increased biodiversity very much in mind. Management and administration of the reserves is undertaken by a team of volunteers and, as such, we are always on the look-out for a bit more help - both in terms of expertise and manpower. If you are interested in helping to look after this wonderful local resource, why not come along to our regular work parties, which are usually held once a month, and if you have any particular knowledge of any aspect of wildlife or habitat management, we would be particularly interested in hearing from you. Access to the reserves is free and open to all, and a network of both hard-standing and grass paths makes it suitable for pushchairs and wheelchair users.